6 days left, but that can change anytime to whatever they choose.edit only 1 day for cider. 6 days left, but that can change anytime to whatever they choose.edit only …6 days left, but that can change anytime to whatever they choose.edit only 1 day for cider. My Tescos only does the 6 packs. Asda only does the 4 packs in banana and strawberry. No cider on my app. 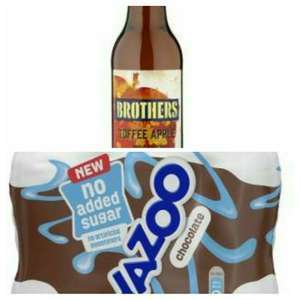 cider has now disappeared off mine, and yazoo have both dropped to 1 day left in typical checkoutsmart fashion like they so often do. they have done this so often before but they still honour the original date of expiry of the offer if you upload a receipt, you have to put yesterdays date as purchase date instead of todays original end date, thats if you purchase it today that is. they have done this so often before but they still honour the original …they have done this so often before but they still honour the original date of expiry of the offer if you upload a receipt, you have to put yesterdays date as purchase date instead of todays original end date, thats if you purchase it today that is. Doesn’t the purchase date need to be yesterday’s too? sorry bit late but no, they will still honour it with the original offer end date, ie today, or at least they have done a few times in the past for me. They're really pushing this stuff. I've already had 3x4 packs and 1x6 pack for free and now there's another 4 pack on offer for free! I might start giving them to the homeless. I just get weeks of Hooch and those bottles of Pilsner.